Since we released the Safe Updates feature we have gotten a lot of positive feedback from you all. Making updates safer is something that we have been prioritizing recently, and right now we are back with an additional perk; the rollback option. In a nutshell, if we detect any type of issue during the update, you are now able to enjoy a fully automatic rollback to its original state. 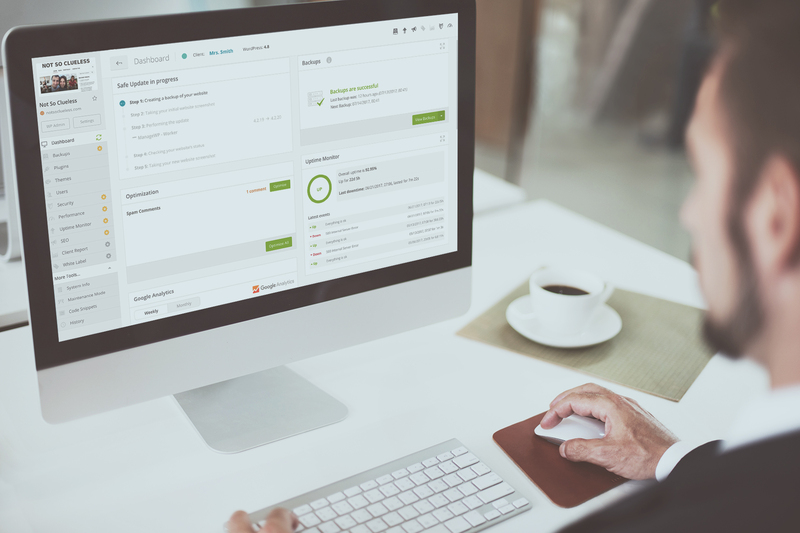 Safe Updates ensures your update of WordPress core, plugins and themes is safer than ever. Let’s quickly recap how Safe Updates are performed. The rollback option is an automatic restore in case something goes wrong during the update. The Safe Updates will follow the usual 7 step process, and at the end if we do detect any issues with your website you can choose to automatically restore your website to it’s previous state (to your latest restore point). When we ping your website if we get a status code between 400 and 599, we will initiate the automatic restore. With the added rollback option you can be sure that ManageWP has your back when it comes to updates. Not only do we have the security of our Safe Updates, but now we have the automatic rollback, which ensures that your website is restored in case of any issues. How do I set up the rollback option? When the first time after introducing the rollback option you run Safe Updates you will get the following screen. Automatically the rollback is enabled. That means unless you check the box, we will go ahead and run the automatic restore on the selected website. If you don’t want to enable automatic restore make sure you check the box. The global settings for automatic restore on Safe Updates can be adjusted by going to Advanced Settings. There you will see two options, one giving you the rollback on all website. You will also be able to adjust automatic restore on a per website basis. 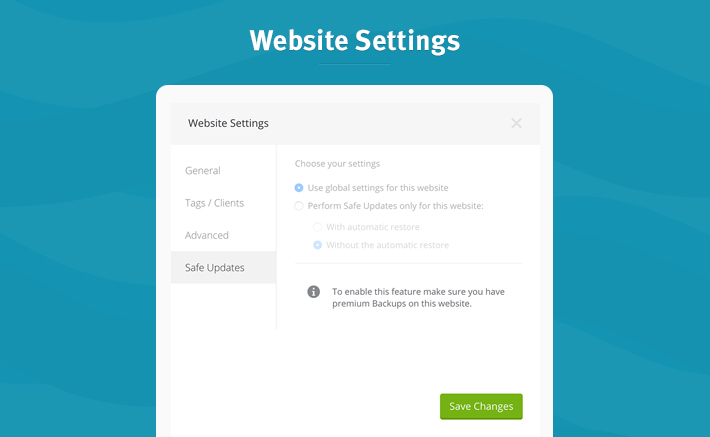 To do that you can go to the individual website, select the Website Settings and there you will find the Safe Update tab. You can choose to apply global setting or to customize them for the website in question. When a rollback is performed you will get a notification telling you all of the details of your rollback. When it was performed, on what website we detected the issues, and to what restore point we rolledback (it will always be your latest restore point). What do you think about our Safe Update automatic restore? Let us know how you get along with this feature, and how we can improve it so that you will never again have to worry about website updates. We aim to have the safest updates in town! 1. It took me some time to figure out that “rollback” and “restore” mean the same thing(?) in terms of features. These 2 terms are used interchangeably in numerous places and honestly created the confusion in the first place. It would help if it were more consistent. 2. Initiating Safe Updates manually from a website dashboard doesn’t require FTP settings, but scheduling Safe Updates does (either on a per website or global basis)? This doesnt make sense to me, given that once the manual initiation has started, it completes automatically and would rollback based on Advanced settings… Or am I missing something? The only thing I can think of, is that in the case of a failed update that you initiated manually, you would then be asked for FTP details in order to restore from the last backup. This is nice feature. It’s helpful for all of us, because we required safe update and secure restore process. Quick question: does the user have the ability to rollback on it’s own ( but not from the latest restore point – because that could be a month ago for the free backup ) ? My question is related to the graphic or functionality distortions that may occur while updating some of the plugins. Sure, at any time you can go to your Backup screen, pick a restore point in the calendar, and roll back to that point in time. It’s useful when you realize that something broke after days, or even weeks went by. Thank you for this new feature! In Step One, do we create the Restore Point for our websites, or are restore points automatically created by GoDaddy with this new feature? Next on the list the ability to update plugins if the plugin is present in dropbox, rather than having to select the sites, go to add plugin, go to external storage and install from there :). If you have many website you need to grab a screensgot of the sites that need the update and then go and select the sites you need, which is a bit cumbersome and annoying.. The one thing I would like to see with ManageWP though is a ‘features requests’ area, where uses can post features that they would like in future releases, and others can vote on them. I love this feature Nevena. Thank you. I have a question now, I’ve been pushing this for a while but haven’t gotten a response. Can we get maintenance and coming soon global templates? It’s a brilliant part of ManageWP for me, and currently I have to copy my coming soon/maintenance templates over to each new site every time i add a new site. I have about 30 sites on my work account and about 75 on my personal account, so you can tell how that gets repetitive! This looks like a very cool feature I will have to give it a test drive, Thank you. Something that might be of benefit would be a setting to be notified if the Update Failed and then allow the user to make the choice of doing the Restore Manually. If you don’t enable the automatic restore you will get the option of restoring manually if something goes wrong. You get a notification with the issues detected and then you can choose to either restore or not.